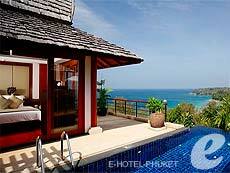 A cottage style boutique resort located on a hill overlooking Surin beach. Newly reopened in November of 2007, Ayara Hilltops (formerly Treetops) is a boutique hotel located on a hill overlooking quiet Surin beach. The rooms are all cottage style. There is a big swimming pool next to the main lobby, and buildings surround the swimming pool. Swimming Pool : There is one main swimming pool. Restaurant : There is a restaurant serving Thai and authentic French cuisine.